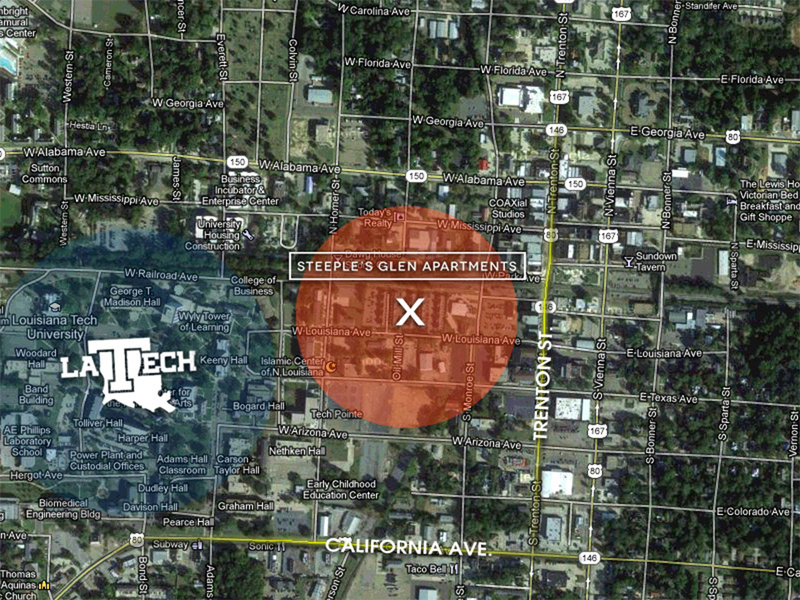 Located right off the campus of Louisiana Tech University on West Louisiana Avenue, Steeple's Glen apartments offers the ultimate in convenience and privacy for apartment living in Ruston. The spacious apartments have 4 bedrooms, private baths, a living room, full kitchen, washer and dryer, patio area, and free wi-fi. 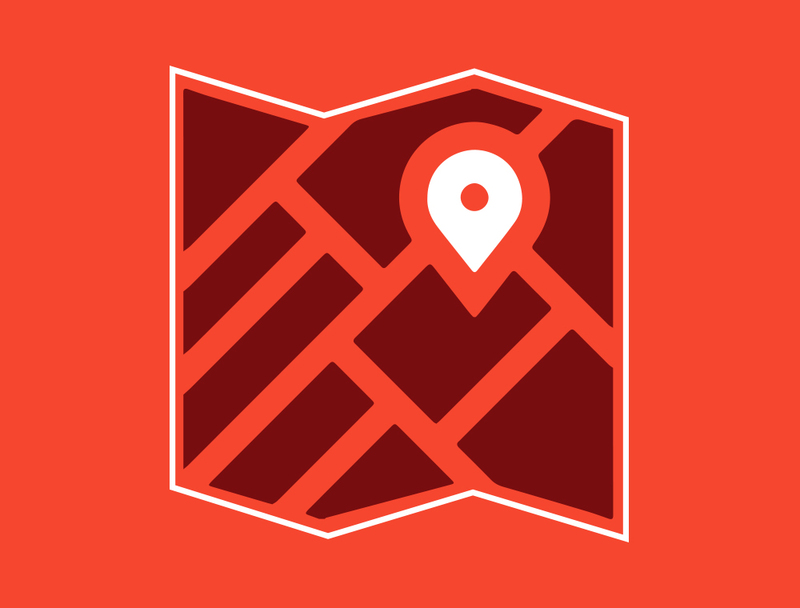 Enjoy walking to the La Tech campus, the grocery store, or your favorite shop in Ruston's downtown area. Best of all, the price is right for the ultimate, college-living experience. Located on West Louisiana Avenue, two blocks behind the College of Business and Keeny Hall at Louisiana Tech University. The apartments are two blocks from downtown Trenton Street, and four blocks from California Avenue. Living area, kitchen and one bedroom/bath downstairs. 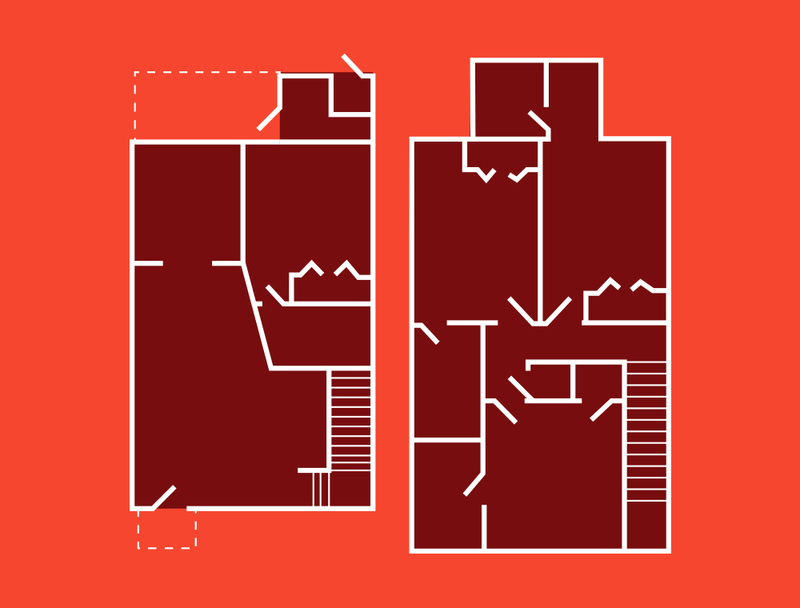 Three bedrooms each with their own bathroom are located on the second floor. Parking is located in front of each unit; a private patio, laundry room including a stackable unit and greenspace is to the back, and garbage dumpsters are at the end of each complex. 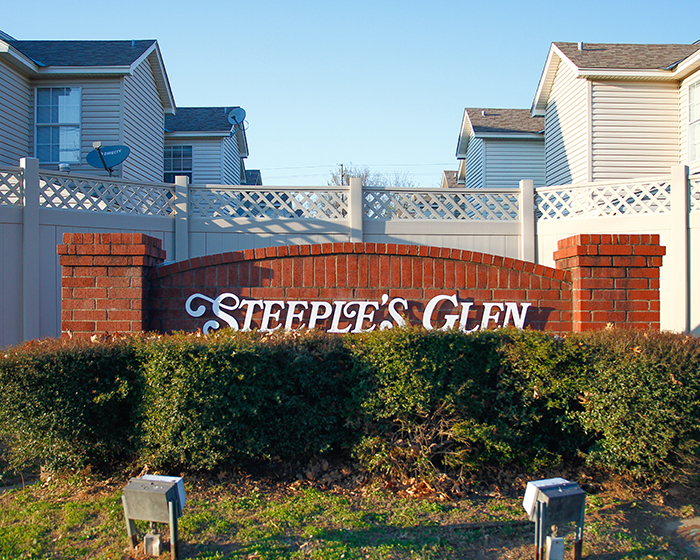 If you're already living at Steeple's Glen, use these online tools to pay your rent or request maintenance. 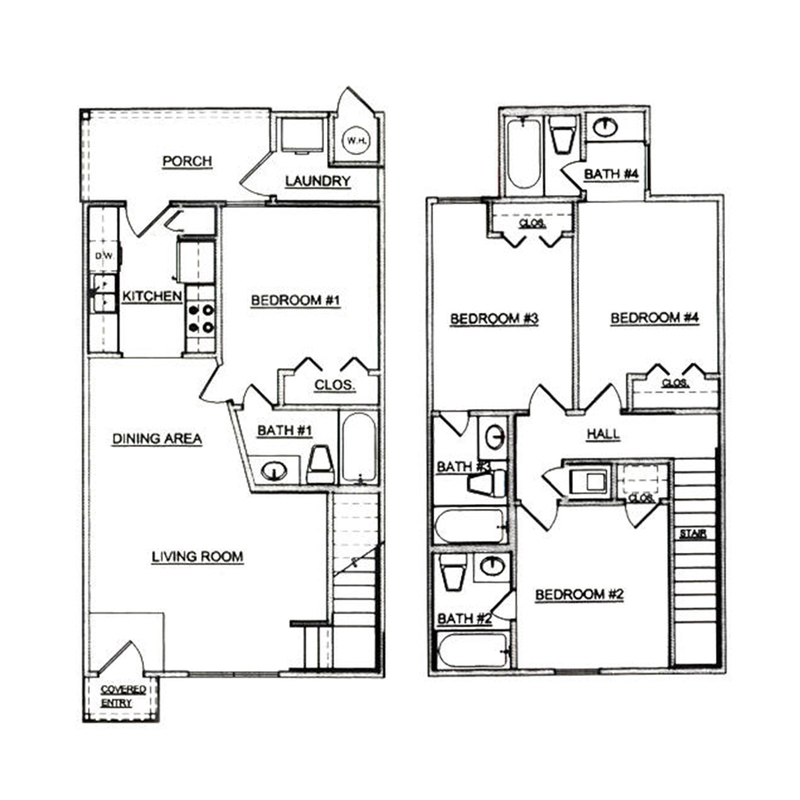 Each unit is 4 bedroom/4 bath and comes with all the amenities. Our staff is ready to meet your needs so you can focus on doing your thing. Please note that Steeple's Glen does not allow pets. Concerned about being away from home? Don't worry - we make living easy. With features like full kitchens, private laundry, individual baths, and free Wi-fi, it's no wonder living is awesome in Ruston's best apartments. 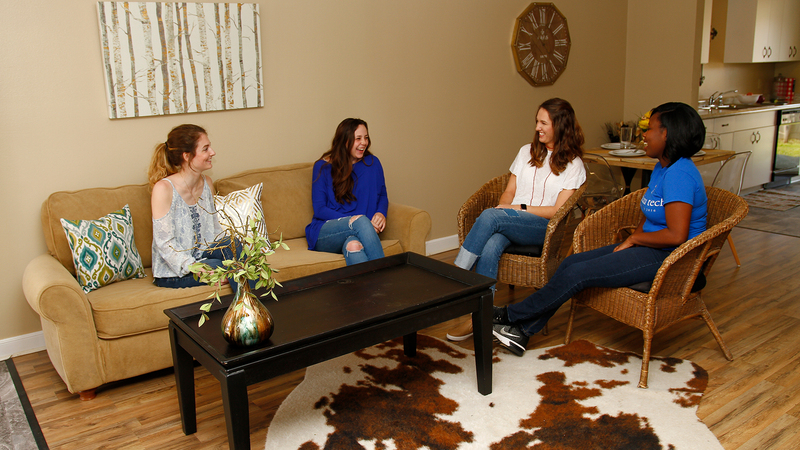 Keep the comforts of home and enjoy the college living experience. Walk to campus or have friends over to grill out. Ride your bike to town or stay home for pop-corn and a movie while you do laundry. 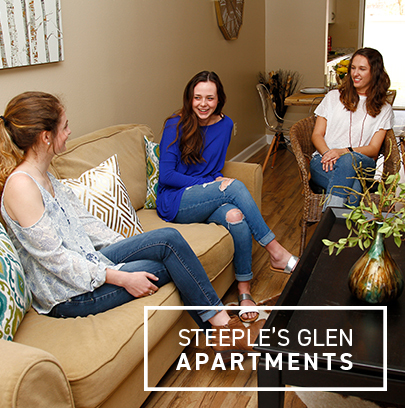 Everything is made easy at Steeple's Glen, the best apartments in Ruston. Each adult wishing to live in the rental unit must submit a rental application. Please download a copy below. Applications are good for 2 months and require a $10 processing fee.